(Front L-R) Sgt Robert W. Hanson (R), Sgt Earl D. Salmon (BT). As Pilot: 6 credited missions: 2Lt William G. Moyer (CP) - 144 (29 April 1944), 146, 148, 149, 150, 151 (11 May 1944). For mission dates and targets see the missions list. (A) Aborted Non-credited mission -- (AS) Credited abortive sortie - Turned back over Belgium - bombs not dropped. 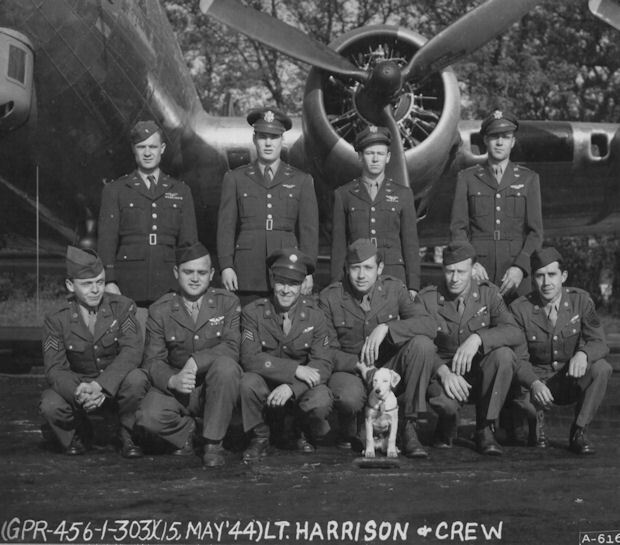 1Lt Weldon O. Harrison (P) - Co Pilot with four different Pilots. Flew as a Lead Crew CoPilot on the 11 February 1944 Schweinfurt, Germany mission. Upgraded from CoPilot to Pilot on orders dated 26 March 1944. First mission as 1st Pilot on 29 April 1944, flew with the 336th BS - couldn't find the 303rd BG(H) formation. Combat tour completed on 11 May 1944.